is a thing that is apparently happening. 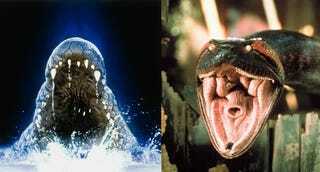 I know when I watched Lake Placid and Anaconda I was left with many questions. Questions like what accent is Jon Voight doing? Why is Betty White in this movie? There's more than one crocodile? (That one is a spoiler I guess.) When the sequels (seriously, can you believe these movies had three sequels each) came out I had many other questions. Questions like does Hollywood have no shame? How are there still crocodiles in this lake? Why isn't the government involved at this point? The one question I never asked is what would happen if somehow the giant crocodile that lives in a lake in Maine fought the giant anaconda that lives in the Amazon. Well, I guess I'm getting an answer.